Detail of balloon-borne experiment called EchoBeach. 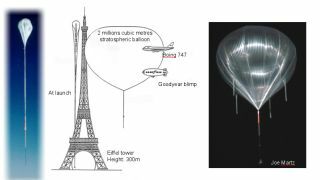 The scientists behind the project call it EchoBeach: a plan to send a giant helium balloon into the skies to study planets in other solar systems. And indeed, it could well be a beachhead for Echo - another ambitious space mission currently under consideration. Led by physicist Enzo Pascale of Cardiff University in the U.K., the EchoBeach experiment would allow researchers to identify what the atmospheres of distant alien worlds are made of – and do so much cheaper than other space missions. Lately, there has been no shortage of exoplanets: new ones are discovered regularly, and today’s count is nearly a thousand. The now retired space observatory Kepler has found thousands of potential exoplanets in recent years; Hubble has also spotted a few, as have several big ground-based telescopes. But so far, scientists have only been able to characterize the atmosphere of eight of them. That’s because exoplanets are too far away, faint and close to their parent stars to be imaged directly. EchoBeach could be launched as early as 2017. It would be a pathfinder for a space mission dubbed Echo, which, if it gets the go-ahead, will also be studying the chemical composition of the atmosphere of exoplanets ‑ but on a much wider scale. Echo is one of five proposed space missions under consideration at the European Space Agency. The verdict on which mission gets the go-ahead should come in February 2014. A CAD model of the Echobeach balloon experiment. While Echo will be able to study hundreds of exoplanets, including those in what is called the “habitable zone” where water could be found in liquid form, EchoBeach will only be sensitive enough to look at the hottest and largest of them, the Jupiter-like gas giants. “Echo will be much, much better. It will be in space, which means the Earth’s atmosphere won’t pollute the observation, and therefore it will be of orders of magnitude more sensitive that anything we have used so far, including EchoBeach,” Pascale said. But Echo would only be launched in 2022 at the earliest, and the balloon-borne precursor would get there first. “While we are waiting for Echo, which will give us the ultimate view of all these alien worlds, EchoBeach could be a forerunner, an aide for Echo, it can help us to design the best possible space mission,” Pascale said. Both projects will be using a method called transiting spectroscopy. The transit method of spotting an exoplanet is indirect, and it is the one that was used by the Kepler telescope. The instruments measure tiny dips in the brightness of stars when a planet passes through the line of sight. Once a planet is confirmed, the next step is to determine its key parameters such as mass and radius. Other instruments then measure whether there is an atmosphere, and if yes, what it is made of. This instrument is called a spectrometer, and that’s what both EchoBeach and later Echo could be tasked with. A spectrometer disperses the light into its different colors, like a prism. EchoBeach and Echo will be working in the infrared part of the spectrum, invisible to the naked eye. There have been a number of balloon-borne astronomy experiments, launched by NASA, France, Sweden and Canada. ESA, though, has so far launched none. The EchoBeach concept has had forerunners. A balloon called BLAST carried an instrument tasked with studying star formation, and preceded a similar instrument on the ESA Herschel telescope, three years before Herschel went into orbit. Another balloon program, Boomerang, was a precursor for an instrument on the ESA-led Planck mission, which peers deep into the early cosmos, studying the Big Bang’s fossil light – the cosmic microwave background radiation. Cosmologist Mark Devlin of the University of Pennsylvania, who is not involved in EchoBeach but has launched 10 balloon-borne astronomy projects, says that such missions can have a significant advantage over space programs. A balloon can carry a telescope above 99.5 percent of the atmosphere and provide a near-space environment. “For many observations, this is perfectly fine,” he said. And they can be conceived, built and executed on a very short time scale compared to a satellite – and at much less cost. This way, a space agency can test new technologies quickly and cheaply, which “significantly mitigates the technology risks for full-blown satellite missions,” Devlin said. The EchoBeach team is currently in talks with U.S. researchers, to possibly launch a balloon-borne mission together.